Atletico Madrid capitalised as Barcelona and bitter rivals Real Madrid both dropped points to go 3 clear at the top of La Liga, putting them on course for their first league title since 1996. 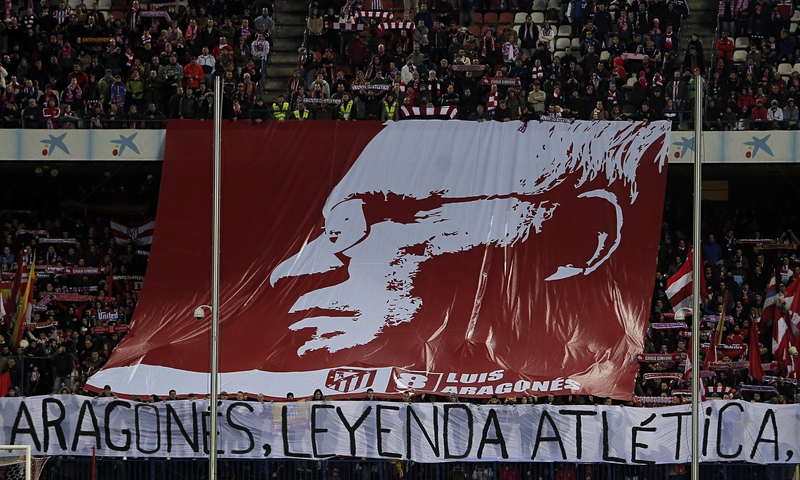 On a night where emotions at the Vicente Calderon where running high following the death of club legend Luis Aragones, Atletico were on top from the start, finishing the weekend on top spot for the first time this season. Before the game, a minutes silence was held for Aragones, and the home fans remaining silent until the eighth minute to mark his number before erupting into a cauldron of noise. The home fans however had to wait until the 38th minute until Diego Costa darted down the left, and pulling the ball back for David Villa to open the scoring, Villa dedicating his goal to Aragones who kick-started the revival of Spanish football by winning the 2008 European Championships. The goal scorer was replaced only minutes after this complaining of a strained thigh. La Real did threaten for 10 minutes after the break, without creating many goal scoring opportunities, but it was Costa for Atleti who scored the important second, running on from a great through ball before passing the ball into the corner of the net – the game was all but won by this point. Two minutes after this Miranda scored from a powerful header, direct from a Koke corner. Brazilian Diego came off the bench to score the fourth following a great piece of individual skill to shoot home into the top of the net. This capped a wonderful night for Atleti who showed their dominance in the final third and they were unable to feel the pressure of Barca slipping up the evening before. A poor Barcelona display at the Camp Nou allowed Valencia to walk away with maximum points, in turn handing advantage to Atleti. Things started well for Barca when Alexi Sanchez opened the scoring after just 8 minutes, when he lofted the ball over ‘keeper Diego Alves following a low Messi cross, however it did appear the shot was actually meant to be a pass to a team mate. Barcelona remained on top, with Messi in particular off form, missing 3 chances he really shouldn’t of. Valencia started to come into the game a little more and on the stroke of half time were level when Dani Parejo slotted home from 10 yards out. Things went from bad to worse for Barcelona just after the break when Sofiane Feghouli crossed the ball and Pablo Piatti rose above Dani Alves looping his header over Vitor Valdes into the Barcelona net. Soon after Barca were awarded a controversial penalty when the ball hit Ricardo Costa, the referee indicated handball, but the big defender insisted it was his shoulder, replays suggest Barca were fortunate, but Messi stepped up and left Diego Alves with no chance. But it was not long before Valencia restored their lead. Once again Feghouli was allowed to get too close to the byline down the right-hand side and the Algerian pulled the ball back for Alcacer to drive past Valdes. As tempers started to run out, things got even worse for Barca when Jordi Alba was sent off for a second booking. With Barca failing to win, the stage was set for Real to maintain pace with city rivals Atleti, however faced a tough away trip at Bilbao. 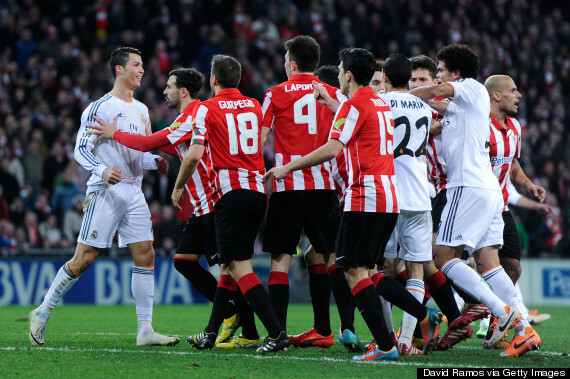 After a bright start by Real, it was their opponents Athletic who wasted two glorious chances. First Aritz Aduriz bent a curling shot just wide of the left hand post, but it was Iker Muniain who missed the best, unmarked at the back post and caught in 2 minds whether to shoot or control it only succeeded in putting the ball out for a goal kick. Madrid’s firepower were missing for the majority of the first half, largely due to the excellent work by the hosts stifling all of their service. Madrid’s big guns started more positively in the 2nd half, but it was youngster Jese who opened the scoring on 66 minutes, following a run down the left by Ronaldo who pulled the ball back for the youngster to slide in. Athletic brought on Ibai for Muniain after 73 minutes and the new man made an instant impact with a superb goal less than a minute later. With his side having a free-kick as he came on, Ibai lofted the set-piece into the area. It was headed clear, but he met the loose bouncing ball on the edge of the area with a stunning strike which flew in off the far post. Then came the controversy. Ronaldo reacted from a shove by Gurpegi and clashing with Iturraspe, although Ronaldo actually grazed Gurpegi’s head with his hand, rather unintentionally, Gurpegi went down as though Ronaldo had performed major brain surgery without aesthetic, conning the referee into a red. Real hung on for a draw, but the red card will hurt them in the coming games. In Saturdays fixtures Malaga claimed a good win over Sevilla. Duda opened the scoring for Malaga from the penalty spot before goals from Carlos Bacca and Federico Fazio put Sevilla in front. Samu levelled the game for Malaga with 13 minutes remaining but Portuguese playmaker Duda popped up to secure maximum points for Malaga. Rayo Vallecano avoided defeat for the first time in three league games by drawing 0-0 at Levante whilst Valladolid managed the same score line away at Getafe. The rest of Sunday’s fixtures seen Elche move clear of the relegation zone following a 1 – 0 win over fellow strugglers Almeria, Cristian Herrera with the only goal and Damian Suarez was given a red after 2 yellows in injury time for the hosts. Betis won for the first time since September with Ruben Castro with both goals, however still remain 8 point behind safety. Monday’s game saw Champions League hopefuls Villarreal hammer Osasuna. Substitute Jeremy Perbet scoring twice with a Manu Trigueros goal sandwiched in between. Oriel Riera scored with a late consolation for the visiting side.